Could this become a model for all future song leaks? AC/DC: "Dah, nah, nah, nah"
Fans attending an AC/DC film shoot in London where among the first to hear new track Rock 'N' Roll Train from the band's upcoming album Black Ice. Rather than risk being caught with recording equipment, one innovative member of the audience memorised the riff and leaked his own sung version onto YouTube. 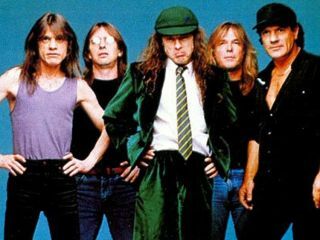 There's been an eight year wait for new AC/DC material and, as you can imagine, the leak has caused quite a stir. One YouTuber heard the sung version, worked out the chords and posted the guitar parts. Another combined both versions and added his own screaming vocals, claiming it to be "the real song". Because AC/DC are the kings of riff, this is actually more effective than it might sound. A series of "Dah, nah, nah, nahs" and a high-pitched section supply a surprisingly clear rendition of what we can expect from Rock 'N' Roll Train. Perhaps this will become a model for all future song leaks - Guns N' Roses better look away. UPDATE: You can now hear the real version of Rock 'N' Roll Train right here.